David was very excited to be invited along to the Dublin Convention Bureau Business Breakfast. The breakfast was to thank all of the Dublin Convention Bureau private sector partners, for another positive business tourism year in Dublin. 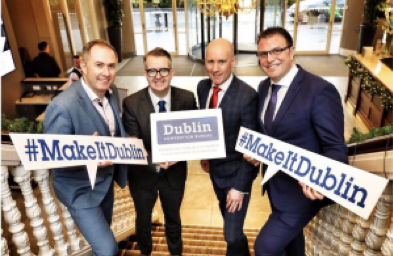 2017 has been a success, with €64 million worth of business tourism seen in Dublin during 2017 and further events confirmed for the city and county as far out as 2022. Sam Johnson,Manager, Dublin Convention Bureau had this to say about working with David “Starting with the pre-event communications and contract – this was so easy, straight forward and understandable with all the detail you could need, written in plain English.